ORANGE – (RealEstateRama) — New Jersey Housing and Mortgage Finance Agency (HMFA) Executive Director Anthony L. Marchetta today joined local officials and representatives of the Orange Housing Development Corporation, The Alpert Group, LLC, and the City of Orange Township to celebrate the official grand opening of Walter G. Alexander Village, Phase III. The third and final phase of the award-winning affordable apartment community includes 42 units, 5 of which are set aside for special needs and homeless families. The HMFA, an affiliate of the New Jersey Department of Community Affairs (DCA), awarded the project highly competitive 9% Low Income Housing Tax Credits, which are expected to generate nearly $7.5 million in private equity. Also, HMFA awarded $5 million in construction and permanent financing and another $3.1 million in federal Community Development Block Grant (CDBG) Disaster Recovery dollars through the Fund for Restoration of Multifamily Housing (FRM). The FRM Program was created in the aftermath of Superstorm Sandy and provides qualified housing developers with subsidies in the form of zero- and low-interest loans to finance the development of affordable housing in the nine counties the federal government designated as the most impacted by the storm. All of the apartments include kitchen appliances, washer and dryer, air conditioning, hardwood floors, and carpeting. Community amenities include a 4,100-square-foot community center, elevator service and on-site parking spaces. Walter G. Alexander Village, Phase III represents the final phase of a redevelopment effort that has transformed what was an obsolete high-rise public housing project into a vibrant, transit-oriented family and senior housing community. Now complete, the entire development offers 156 total apartments comprised within five townhouse-style buildings and features pedestrian friendly sidewalks that connect to nearby transportation hubs. The first two phases featured 66 family housing units and 48 senior housing units, respectively. Support services for special needs residents are being provided by Interfaith Hospitality Network Services (IHN) of Essex County. Priority for residency is being provided for the first 90 days of lease-up to Sandy-impacted individuals who have been displaced by the storm or whose homes sustained major or severe damage from Superstorm Sandy. Applications are still being accepted. 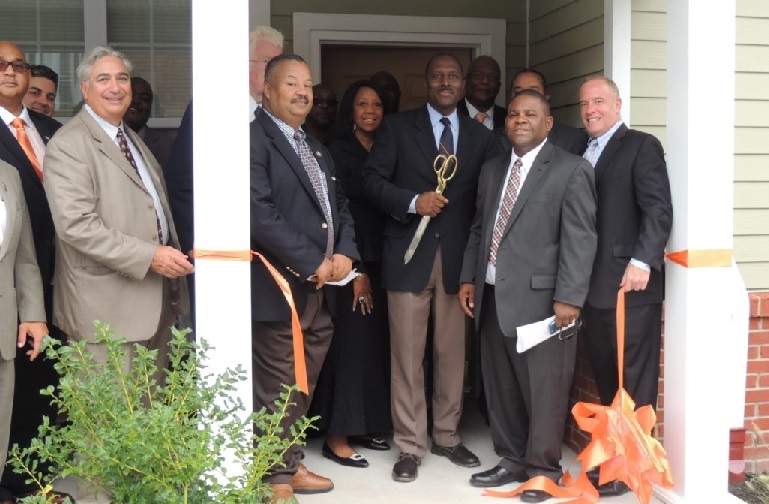 For more information, people can call the leasing office at Walter G. Alexander Village at (862) 766-5148 or visit http://haconj.org/projects/. People can also find information by visiting www.renewjerseystronger.org and clicking on “Priority Housing for Sandy-Impacted Residents Available” at the top of the webpage. The website provides such information as where projects are located, the total number of housing units, contact information for the leasing office, website/phone number for people to submit applications, and the date applications are being accepted. New information is added regularly as it becomes available. HMFA estimates that Walter G. Alexander Village, Phase III generated approximately $18.9 million in one-time economic output and created approximately 113 direct and indirect/induced full-time jobs during construction. Now complete, the project will continue to add value to the community by providing more than $2.1 million in ongoing economic output, and 11 direct and indirect/induced full-time jobs annually. The Walter G. Alexander Village redevelopment is part of a Payment In-Lieu of Taxes (PILOT) Program that provides the City of Orange Township with approximately $30,000 in revenues over the next 30 years. Other funding sources for the project’s third phase include the Housing Authority of the City of Orange Township and Enterprise Community Investment. The community was developed by Orange Housing Development Corporation, in partnership with The Alpert Group, a Fort Lee-based real estate development and management company with experience in multifamily projects. The development team also included Kitchen & Associates architects, The Metro Company, LLC, as financial and planning consultant, and Del Sano Contracting Corp. as the general contractor. For more information on HMFA programs, please call 1-800-NJHOUSE or (609) 278-7400, or visit www.njhousing.gov.